Hot on the heels of the Bilderberg Group meeting in Watford comes the G8 meeting in Northern Ireland and the inevitable wave of protest, heavy handed policing, and polarizations playing out on tarmac. Protesters have taken to the streets of London in a planned, week long, ‘Carnival Against Capitalism’ as riot police turned out in force, making 57 arrests yesterday. 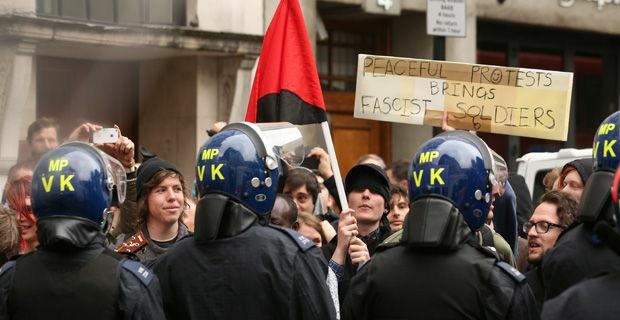 Officers also raided a location in Soho, clearing a major meeting point and organisational centre for protestors. Raiding an address Beak Street, officers claimed they had been tipped off about weapons and the intent to cause criminal damage, although by ‘weapons’ what they apparently meant was ‘paint bombs’. Bursting into the property with their customary grace, police were accused of brutal tactics and violence by protestors and one man tried to jump off the roof of the building yelling "I don't want to live in a fascist state"
StopG8 said many of the world's "most brutal and polluting companies" were in London's West End, as well as government offices and the "mega rich", although one office worker who was unable to go home because of the police operation did understandably wonder why they weren’t focusing their attentions on the City of London. Several hundred protestors marched through the West End, finding lines of police wherever they went and that iconic symbols of wealth and privilege like the Ritz had taken steps to barricade themselves against any possible damage. One does have to wonder about the protestors tactics it must be said. The more they attract this kind of attention, the less people in ‘the middle ground’ who may object to many of the injustices inherent in corporate, globalised capitalism feel comfortable marching alongside them. And this anti-capitalism moniker. It’s all too easy to dismiss their concerns as fringe troublemakers when the label ‘anti-capitalism’ attaches. Whether that is the media referring to them as such, or indeed their own idea, it seems that something more targeted against injustice or specific distortions of capitalism into corporatism would be a much more serious way of identifying their protest than a blanket dismissal of a market based economy. A police spokesman said: "We are aware of a number of people planning to protest and we have an appropriate policing plan in place, as was evidenced yesterday."